What Would We Do Without You? You made no secret about it. You weren't big fans of elevating leg rests. They were hard to work with; they were easy to break; they were "clunky". Voila. For you we crea ted the Perfect Leg Up (SRPLU). The gas piston design and the 'make it so it won't easily break' approach we take to product design led to a truly superior product. You told us you loved it. We were so happy. But then, you told us... "not so fast" What we should have expected, yet didn't, is that this great leg rest would lead you to ask our help solving another problem you've had with elevating leg rests - how to help the client in a lightweight manual chair who has broken their foot, ankle, or leg and needs an elevating leg rest during the recovery period. The only option that was available up to now was to take them out of their chair and put them in a chair that an elevating leg rest could be added to. And this was not a solution that you OR the client really liked. And we had no idea how wide spread the problem was until the recent European Seating Symposium in Dublin Ireland where we showed off our solution -Perfect Leg Rigid Adapter -1" which allows you to put the Perfect Leg Up on a manual chair. Almost every therapist who saw the adapter said "Wow, I could have used that with ....". (fill in the blank with the chair of your choice.) So once again, peace and harmony are the order of the day at Gel Ovations until one of you says...."you know, I have a problem with..." Contact me about our revolutionary new rehab products and more. Chris 302-494-9070 chris@gelovations.com The Naked Truth Sometimes it's fun to make an argument just for the sake of it. Let's have some fun. Here are the top reasons why it's really good for you to sleep naked. This is of course, totally non-scientific. (Or at least mostly non-scientific) Feel free to write an opposing piece and send it to us, if you like. If we like, we'll print it and give you full credit. 1. It is easier. One pair of pajamas (for staying at your relatives) is all you'll need. Reduce your sleep attire expenditures and your washing. Sure you'll have to wash your sheets more often, but be honest; how often are you washing them now? 2. It keeps you "ready". By keeping real clothes on, until bedtime, you avoid the whole "I'm already in pajamas" thing which turns out to be an oft used excuse for why you can't do something, like taking in a late movie when a friend calls. 3. Be free. No constricting garments to hamper movement. It's like taking off your shoes when you get home, but over your whole body, not just your feet. 4. You're ready. You're next to your loved one. You turn over and suddenly, without planning two bodies are touching each other. Need I say more. 5. You'll sleep better. Even if the above activity didn't result in physical activity which will relax and gently fatigue you, many people report having a better night's sleep in the absence of restrictive night attire. 6. Helps you regulate your cortisol. (sort of science) Cortisol is a very strange chemical in the body and when the body gets too hot, cortisol production goes up. This can affect your metabolism and inhibit weight loss. 7. Balances your melatonin and growth hormone. (yeah this is kind of sciency too!) Keeping your sleeping environment below 70 degrees (F) every night can help your body regulate its melatonin and growth hormone levels. Sleeping in clothing can result in your body heating up which interferes with these hormones and you may grow old faster (or maybe just older-looking, and who wants that?) 8. Keeping it healthy down there. For men, cooler keeps sperm healthier and for women cool may help reduce yeast infections since yeast grows better in warmer and moist environments. So there you have it. Eight good reasons for sleeping naked; one for every finger on both hands. And yes, I'm not counting thumbs as fingers, but I'll save that article for another time. Opening Size Specifications 1" for Ti-Lite TX 1 1/8" for Invacare Crossfire 1 7/32" for Ti-Lite ZR 1.063" x 1.32" elliptical for Q7 Perfect Leg UPNOW available for Quickie Q7, TiLite & Invacare Top End & Coming soon to a size near you. 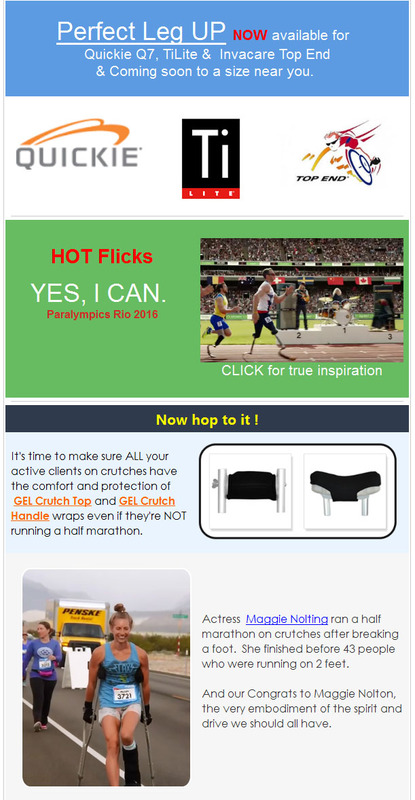 CLICK for true inspiration HOT Flicks YES, I CAN. Paralympics Rio 2016 Now hop to it ! It's time to make sure ALL your active clients on crutches have the comfort and protection of GEL Crutch Top and GEL Crutch Handle wraps even if they're NOT running a half marathon. Actress Maggie Nolting ran a half marathon on crutches after breaking a foot. She finished before 43 people who were running on 2 feet. And our Congrats to Maggie Nolton, the very embodiment of the spirit and drive we should all have.